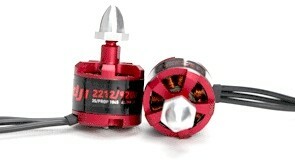 This is the DJI 2212 920Kv Brushless Motor for all of the Flame Wheel air frames F330, F450 & F550. It's a very reliable motor and it delivers a very good level of thrust with the matched 10" propellers or the 8" Propellers. The motor should be used with 8" props when using a 4s Lipo pack and 10" props when using a 3s Lipo pack. Size: 22 x 12 mm.